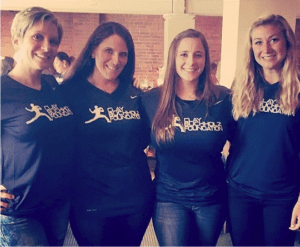 Falmouth Road Race 2017: Meet our Reach Athletes! 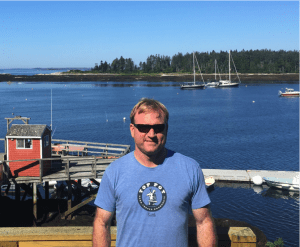 Home » Falmouth Road Race 2017: Meet our Reach Athletes! We are excited to have such a motivated group of Reach Athletes running on behalf of the families we serve at the 45th annual Falmouth Road Race! Our runners will join more than 11,000 racers weaving their way through seven miles of Cape Cod. 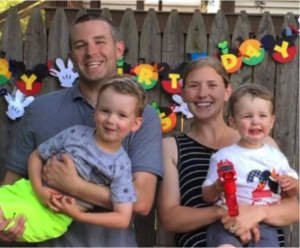 Help them support families like Jessica’s and accomplish their fundraising goal by clicking on each of the names below and donating to their page. Together, we can make it to the finish line! Do you have any pre-race plans or rituals? What are your goals for this race? What does Family Reach’s mission mean to you? The Falmouth Road Race has a renowned history. It will be pretty awesome to share the road with some of the best runners while also raising money for a great cause. Not really. I just try to be sure I hydrate, stretch and have a good playlist to keep me motivated throughout the run! My goal for this race is to finish my first ever 10K. Family Reach’s mission is so important to me. Two of my close friends work tirelessly for Family Reach, and I am honored to play a small part in supporting their mission to help families battling cancer. I’ve read so many stories on the Family Reach blog. All of the families are motivating to me! I often go to the beach in Falmouth and it’s a beautiful route, but most importantly I wanted to run because it’s for Family Reach. Pre-race I will drink tons of water and maybe do a meditation. I hope to hit my fundraising goal and finish the race without stopping to walk. Family Reach is such an important cause. After my own cancer diagnosis, I saw the impact it had on my family in many ways, but especially financially. I am so inspired by all of the families I have read or heard about…The people who are courageously fighting and the loved ones and caregivers who are fighting as well! 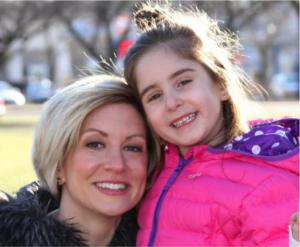 I am motivated by Jessica’s family and all of the other families who Family Reach helps. It’s a tough course, but a lot of fun and so beautiful. Going down early with my husband and two boys to spend the weekend and enjoy the Cape! To finish and feel good about it. I’ll be slow, but that’s okay! As a nurse, I have seen how difficult it is for families when they are fighting cancer. Every patient deserves to have their family by their side without any extra worries. Jessica. She has endured so much and remained so strong! I thought it would be a great opportunity to support Family Reach. Limited pre-race rituals – stretching and thinking about the course I will be running. Family Reach has a very special mission. It truly has a positive impact on the countless families being supported. It is hard to imagine experiencing the impact of a child’s cancer and the financial struggles so many families face. I believe there is a real correlation between financial stability and health. All of the families impacted by cancer. I am a pretty committed runner and this is a very well respected race. 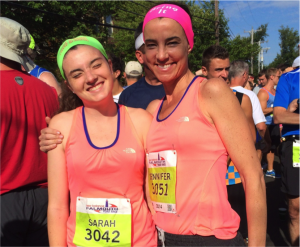 Plus, my daughter will be there this year and I am running for Family Reach! Lots of good reasons. Carbs the night before (including a good beer) and lots of water the morning of, but I stop hydrating 90 minutes before the race. Enjoy it! I feel very fortunate to be healthy enough to run. Every step is a gift. I am so inspired by the amazing work that Family Reach does. When my younger sister died of cancer when we were in our 20s, it took a huge toll on our family, including financially. Helping families while they are in the midst of a cancer-crisis is a critical mission. The entire Family Reach team gets that. All of them to be honest. I enjoy reading the spotlight on each family, but I become particularly emotional when I see teens on the cusp of launching being derailed by a cancer diagnosis. Our Reach Athletes deserve all of the support they can get! Use the hashtag #ReachAthlete to encourage them on social media and don’t forget to tag us at @familyreach.